Yesterday was quite a day for me. Yes, I turned 80. Had a dinner out with my good friend, adoppted daughter, I call her, Robin. But I had so many well wishes from everyone in my online friends and then also most of the relations on Face book. Yes, I am on Facebook because of my oldest Nephew RL in Houston. After my sister, his mother , passed away several years ago he started it and wanted all the kids, grandkids, nieces, nephews etc. to get on to stay in touch. Even my big brother in Oregon finally got on because of his kids. I don't talk much, not like my daughter who has to go to Facebook as soon as she logs in. Anyway more about my birthday. My daughter had been up on Tues over night and took me out for lunch after I got out of the beauty parlor. She had lots of things to do before leaving for a week on Sat. This is the block that Kim found online with the instructions starting this coming week. I didn't want to wait so figured it myself. Using charms so 5 inch blocks to make the HST. 2 1/2 in strips for the 4 patches. I spent most of the day, sewing. Am making lots of half square triangle and 4 patches . What fascinated me about this block is the many, many ways to set it. I've had to make a few blocks to see. I really wanted that to be down here but it doesn't matter. See if you turn the blocks you can have a different design. So that kept me busy during the day. In the afternoon my oldest granddaughter, the artist, called me for a chat. She's back in Philly working and waiting for school to start, her last year. Roben called about 4 and wanted to know if I was ready to go. She wanted to go to Wal-Mart sometime in the evening. Decided to head out of town towards Pa. A little town and see what kind of restaurant we could find. First found a neat farmers market and stopped and got some corn and fresh peaches. On and came across this buffet style restaurant that has sort of gone the way, this one has been there for a long time. Country cooking and help yourself to as much as you want. fried chicken and all the trimmings. Too much. Couldn't pass up trying some of the 20 pies they had. Since we were in the area with lots of Mennonites they had an Amish specialty, Sho Fly Pie. Very rich. My Mother-in-law used to make them. So too full we left to find a new Wal-Mart that she had heard opened. Really out in the country but found what we wanted. I wanted to get some of the oldies I like to listen to on CDs while sewing. Didn't find a Frank Sinatra or Bing Crosby but did find 6 that will be good listening. Then she wouldn't let me pay for them. So Happy Birthday. We headed home and parted ways. Later I got a phone call from my niece in Colorado Springs, who will be visiting me for a week in Aug. Then heard the beep of call waiting. Got the next that I thought would be my son, but what a surprise, My oldest grandson, that I hadn't heard from or seen for over two years. He is a chef in an exclusive restaurant on the Chesapeake Bay. He will be coming to the Memorial in Aug. for his PapPap. I forgot to say while we were shopping in Wal-Mart my cell phone rang. surprise, Last two grands of Daughters, called and being on a speaker phone, sang Happy Birthday. They used to do this when a lot younger. Now going on being a Senior in College and a Junior in High School, was really a treat. Gee, thanks again all of you. I had to call daughter and tell her, she had texted all of them to say it was my birthday. But still great. Son didn't call but got another short email saying he would call today sometime. Being where he lives sometimes his cell does not work and he has to call while in the valley. He will be coming in a couple weeks. I was very late getting to bed but what a wonderful day. Well , it isn't everyday you turn 80 years old. Thankfully in fairly good health. Now looking forward to a Cruise to the Bahamas with my daughter. Thanks for listening and I will be back in a couple days. HAPPY BIRTHDAY.... sounds like you had a wonderful day!! Love the blocks on the design wall.. Happy Birthday!!!! And many more come! It sounds like you had a wonderful birthday, and I hope you enjoyed a bite of that Shoo Fly Pie for me!! Hugs!! What a delightful birthday! I'm glad you enjoyed it. You'll be smiling for awhile now! What a wonderful birthday! Belated happy birthday to you. Happy birthday, Eileen!! 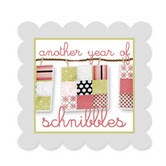 I am glad you had a wonderful day...that is a gorgeous scrappy wonderful quilt you are making there! Happy Birthday! How wonderful to have all the family checking in. Sounds like a fun day. The pattern that you are working on now is one of my favorites. Your colors, as usual, are gorgeous. Happy Birthday Eileen, I'm so glad you had a wonderful day. Well, happy, happy birthday, Eileen!! So nice to hear from all your family and friends, too. Love your blocks - they look wonderful. Sounds like you had a great dinner, too. Are you coming up to Hershey to "Quilt Odyssey??? Your new blocks are fabulous Eileen-just like you dear friend. I think that they are so colorful and happy. What a nice trip to Walmart you had - nothing like music to make your heart sing. 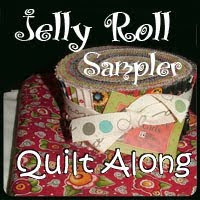 I love having music on when I am working and quilting. What is in Shoo fly Pie? I have heard of it but I don't think I have tasted it. You are making me want a piece of pie. The local specialty is Saskatoon Pie ( they are sort of like blueberries but with a juicier richer flavor- yummy). My grandmother and I picked many a pail of them on her farm. She would hold the barb wire fence wide open so I could crawl between and then she lift her legs over the top because she was tall and long legged. It was always a fun time picking them- and they were easy to clean too. Glad you had a terrific birthday. The Bahama trip is not too far away. I bet you are looking forward to it too. Happy 80th Birthday to you!!! Sounds like your day was wonderful! And I love the pics of your quilts! Very beautiful! The blocks you created are wonderful!!! Happy Belated Birthday! Sounds like you had a very good one, and it will go on for a few days. Your quilt is going to be a stunner, already very pretty. Hope the cruise is wonderful and relaxing. Happy Birthday and many more!!! What a grand birthday you had---that's wonderful!!!! Love your charm square blocks! Just found your blog today and am thoroughly enjoying it. Happy belated birthday and cruising! You're a real inspiration!